Prime Minister Justin Trudeau was criticized Wednesday in Kamloops for the RCMP’s raid of a check point and camp on unceded Wet’suwet’en territory earlier this week. B.C. Premier John Horgan and Prime Minister Justin Trudeau both broke their silence Wednesday on a pipeline company’s injunction against members of the Unist’ot’en House and Gidimt’en Clan, and the RCMP’s raid Monday on unceded Wet’sewet’en territory. But observers say the leaders were misleading, or skirted fundamental questions related to Indigenous jurisdiction and title at the heart of the conflict around the LNG project in northern B.C. He also suggested free, prior and informed consent did not mean First Nations could have a veto on resource development projects. Horgan cited a comment he said Kwikwasut’inuxw Haxwa’mis First Nation Chief Bob Chamberlin “categorically and unreservedly” made during recent negotiations between the government and Indigenous leadership over fish farms in B.C., “that the U.N. Declaration on the Rights of Indigenous Peoples does not mean a veto. “It means we need to sit down and find a way forward on consent,” Horgan said. In a written statement Thursday, Chamberlin, who is also vice-president of the Union of B.C. Indian Chiefs (UBCIC), and Grand Chief Stewart Phillip of the UBCIC rejected Horgan’s comments. They said there’s an “extremely important distinction” between the situation in Wet’suwet’en territory and the recent announced closure of fish farms in the Broughton Archipelago, where government and First Nations worked together in a “jointly developed consent-based process where our Title and Rights were recognized,” they write. 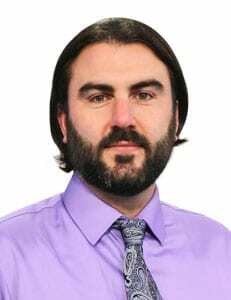 Phillip also said they “reject the racist notion of veto perpetuated by industry and government, which falsely implies that Indigenous Peoples demand a unilateral final say on decisions that impact them. Horgan wasn’t the only leader under fire after publicly addressing Monday’s raid of the Gidimt’en Clan’s camp, established a few weeks ago to protect their part of Wet’suwet’en territory. 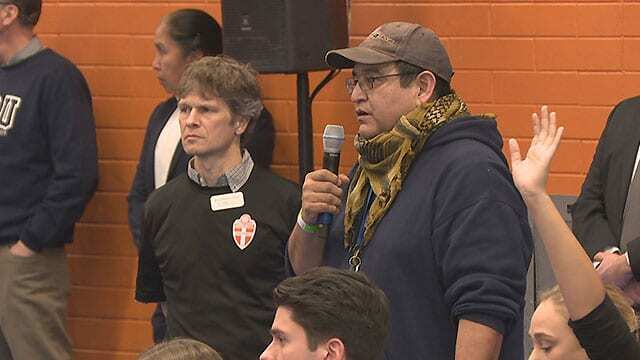 At a town hall event in Kamloops Wednesday evening, Arnie Jack of the Secwepemc Nation pressed Trudeau on the Trans Mountain pipeline and asked the prime minister for evidence the Secwepemc ceded or surrendered their lands to the Crown. Jack told Trudeau agreements with leadership whose authority was established under Canada’s Indian Act does not equate to consent from the Nation. “You can stand up all of the elected chiefs that you want and say that you have consent, but you do not have consent from the people on the ground,” he said. 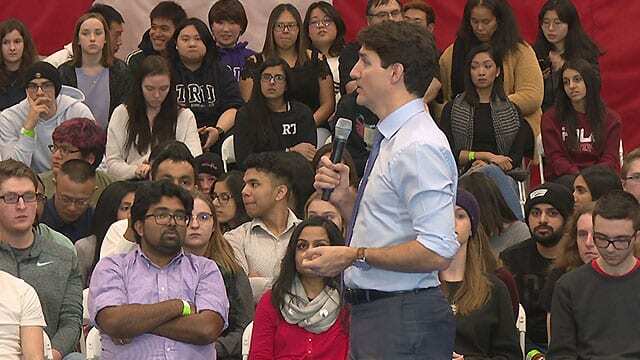 “What you did to the Unist’ot’en — that’s a national disgrace,” Arnie Jack of the Secwepemc Nation told Trudeau Wednesday in Kamloops. APTN photo. When Jack told Trudeau he “may have bought a few INAC chiefs but you don’t own us all,” the prime minister’s response resembled something he said to a Secwepemc leader last month at an Assembly of First Nations special chiefs’ assembly in Ottawa. On Dec. 5 Neskonlith Indian Band Chief Judy Wilson told Trudeau that on the issue of Trans Mountain Canada does not have the consent of the proper title and rights holders of the Secwepemc Nation, who she said are the collective people and not elected Indian Act chiefs like herself. After hearing Trudeau’s remarks to Jack Wednesday evening, Wilson said she believes the prime minister is “dividing” the people of her Nation, “and being selective” in who his government deals with. “He’s trying to say the Indian Act chiefs and councils have the authority and jurisdiction for the territory, which they don’t,” Wilson told APTN News. Thousands of Indigenous people and allies across Canada sent messages of support to Unist’ot’en on Tuesday, many of them also ordering the federal police out of the unceded territory. He said this is where the RCMP got it wrong in a statement they posted to their website before enforcing the injunction, and then later retracted. In an unusual move, the RCMP publicly interpreted Aboriginal case law to justify removing Indigenous people from their lands. Grant said the RCMP were “right to retract their statement,” adding “it’s not that title doesn’t exist pre-declaration, it’s that the government is refusing to recognize title before a court declaration. In Kamloops, Jack issued a stern warning to Trudeau, saying if the government tries to force the Trans Mountain pipeline through Secwepemc territory his people are “prepared to meet you on the ground this summer anywhere you want,” alluding to the month-long Gustafson Lake standoff in 1995. Your children can apologize for this in the future. Colonialization although regrettable in many aspects, happened. This is undeniably true. The system of democratic government in place in Canada is there to serve the greater intrest of the combined people of Canada, including first nations people. There are many faults in the law in regards to that, although things are moving forward positively, albeit slowly in many cases, towards an inclusive recognition of the rights and culture of first nations. In a post colonialization Canada, the word “unceded”, has no meaning. Since the word literally means something that hasn’t been conquered or ceded through treaty to the Crown. Both of the aforementioned things have happened to all land in Canada in the past. The past can not be reversed, but people can move forward in making this a better nation as a whole, inclusive and respectful of all. Just because someone refuses to accept something does not make it true, even if they do so passionately. We recognize hereditary rulers only for ceremonial and symbolic purposes. We executed the King in 1649 the present Queen has no power to legislate even though we use her signature on legal documents. We instated democracy so that we might remove bullies, corrupt leaders and the insane without violence. it’s kind of amazing that anything ever gets done in BC. That’s really what should be celebrated. Whatever of any project is able to be completed. Although Trudeau and Horgan were elected they do not speak for me, either, similar to the elected Chief and Council situation. Perhaps the people on the ground need to be consulted in both Indigenous and the broader Canadian community before either set of elected. leaders take any more action. Trudeau looks as if the heaviest thing he ever lifted was a pen.